Soma's Porteur Rack is strong and stylish with a CrMo steel construction and extra large platform. The lower section of the rack can be mounted to either the hub axle or fork tip eyelets, and a single upper strut mounts to the fork crown, making this heavy-duty rack compatible with a wide variety of bike designs. Extra eyelets have also been added for dynamo lights and other accessories. In addition to the ample cargo space above, Soma has added lower horizontal struts which accept small bags or panniers. They also produce an optional upper "fence" which is sold separately. The Porteur Rack is available in Black. Its platform measures 36 x 30cm (width x depth). 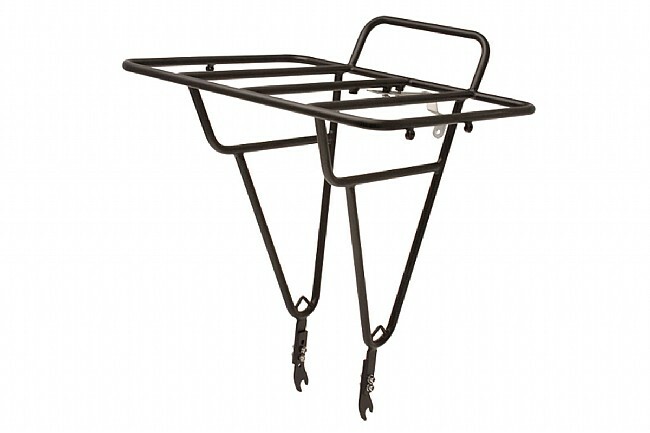 I wanted a front rack to hold my bag andor groceries, but didn't want something heavy or massive like a Gomah rack. The SOMA rack is lightweight and has plenty of mounting options for netting or bungy cords. You can buy a railing add-on that fits this rack if you don't want to use bungy cords and want to keep your items from sliding off the the rack. I bought a Paul's Components GINO light mount and attached it to the side of the rack, but if I'm honest, it would be great if there were a mount on the front of the rack for lights. Other than that, it's a great rack. Delivered in a timely manner, as expected. Courier work. Pizza delivery. Works great! I live in Alaska and commute by bike year-round as it's more practical (and a lot more fun) for me than owning a car. I am very impressed with both the product and with BikeTiresDirect. The rack was simple to install with the included hardware and it looks pretty badass on my fatbike. It is lighter than I anticipated, yet seems to be quite solid. I hauled my mandolin around town and the rack worked perfectly. It should no doubt work fine for camping gear, beer, or takeout. I was supremely pleased with the reasonably-priced shipping to AK, Most places charge absurd amounts. Also, it arrived at my door 4 days after ordering. Four days to Alaska! That's astounding. I'm sure I will order more things from BikeTiresDirect. Well made and a good design that allows multiple mounting options. If you are looking for a solid front Porteur rack, I recommend the Soma. Great Rack, sturdy, with mounting options for different size bikes. get it! I'm very happy with this rack. I've been using it now for about two months, and really have no negative comments about it. It took some care to install, but I chose it because it has height adjustment in the legs, so there is little chance of having it end up not level. It is supported on the axle so the weight of your load is not bearing on weak little frame eyelets. - also you can mount front panniers on it below the main platform. The only limitation i've found for this rack is that I'm able to stack a load on it that actually weighs more than the bike itself! This results in a sort of tippy situation, but with some care, you can still maneuver your load home. I'd say get it, I can't find a better rack.